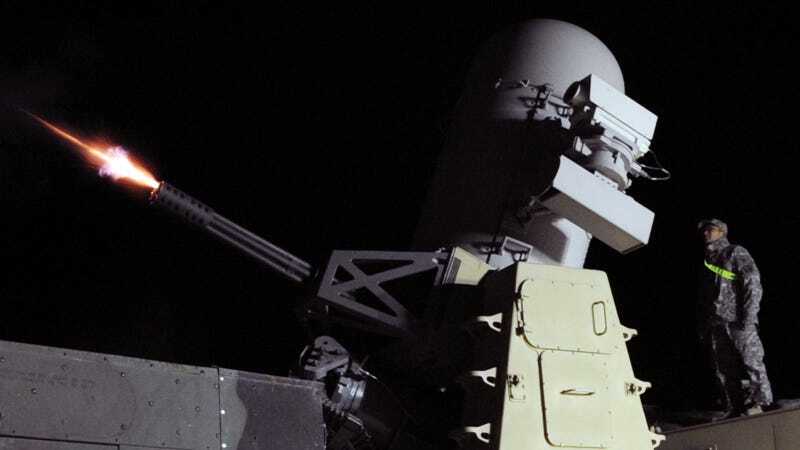 The US Navy's Phalanx Close-In Weapons System (CIWS) is the last line of defense against inbound rocket and missile attacks. When it detects inbound threats, it automatically unleashes a torrent of armor-piercing rounds. And, not content to let the Navy have all the fun, the US Army is currently developing its own land-locked version, the C-RAM Centurion. First, a bit of history on the original design. The Phalanx CIWS, pronounced "sea-whiz", was originally developed in the late 1960s as a terminal defense against anti-ship missiles (AShMs). It is essentially a self-targeting Gatling gun. The Phalanx utilizes a 20 mm M61 Vulcan autocannon linked to a Ku-band radar system and Forward Looking Infrared (FLIR) for targeting. The entire unit is self-contained and can operate autonomously—locating, tracking, and engaging fast-moving targets. The very first prototype was installed aboard the USS King in 1973. However, given the relatively archaic technology at the time, numerous upgrades to the computer control system were necessary over the years to improve its combat readiness. The modern CIWS employs dual antennas to track targets. The primary radar continually scans for incoming threats, and measures a potential target's bearing, speed, and trajectory. Once that system confirms the incoming threat, the secondary targeting system kicks in. When the Phalanx decides the threat is within maximum "kill" range, it unleashes a stream of bullets to detonate the warhead before it reaches the ship. The Army's Counter-Rocket, Artillery, Mortar (C-RAM) Centurion system, developed in part by Northrop Grumman, works much in the same way. It grew directly from the Phalanx project in 2004 as a means of protecting US bases in Iraq. It utilizes the same 20mm 2000RPM autocannon and self-contained design. However, it employs additional sensors, different ammo, and is mounted on a semi with an attached generator. The C-RAM has more threats to defend against than its seafaring brethren—specifically, mortars—therefore it employs additional tracking sensors, including the Army's Lightweight Counter Mortar Radar (LCMR) and Q-36 Target Acquisition Radar (AN/TPQ-36 Firefinder Radar). These can target, track, prioritize, and eliminate multiple incoming rounds before they hit the ground. They also include a warning system for nearby troops. The C-RAM also differs from the Phalanx in that the CIWS rounds are generally only in danger of hitting the ocean if they miss the target. On land, they are much more likely to cause collateral damage. So instead of the full-tungsten anti-armor rounds the Navy uses, the C-RAM's rounds self-destruct before they hit the ground. All told, the Centurion can reportedly defend a 1.2km square area from airborne threats with a 60 to 70 percent shoot-down rate.